The one and only Shaggy…I remember his first U.S. tour, he hit small clubs like the one I frequented in Denver, Colorado, in 1993, The Yardie Lounge, hosted by DJ K-NEE. The artist did track shows in clubs like this hot one, meeting and greeting the people personally with his wit and style and boy-next-door charm. This was on the heels of his first successful single release, Oh Carolina which was a remake of the 1958 version by the Folkes Brothers and produced by Prince Buster. Shaggy’s version, which broke the Billboard Hot 100 chart, featured the original riddim and chorus with Shaggy weaving a tale throughout with his trademark baritone, almost cartoon-like in his delivery. The original tune was a pivotal recording in the development of reggae, considered the first ska song by some historians, as Buster linked Count Ossie to incorporate nyabinghi style drumming and chanting, and by doing so, elevated the exposure that the marginalized Rasta community received when the song became a hit amongst all of the classes. 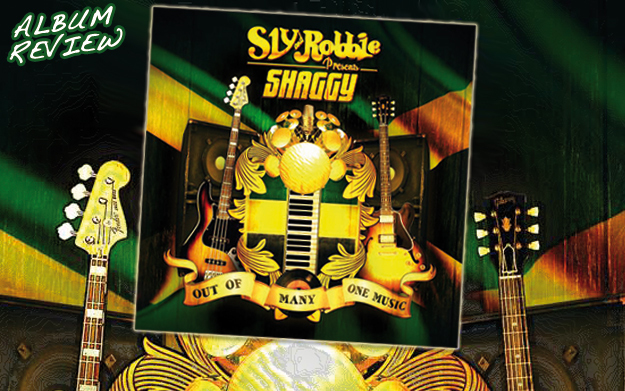 With the new set Out Of Many, One Music, produced by the of “riddim twins” Sly & Robbie, Sting International and Steven “Lenky” Marsden (Buju Banton, Sean Paul, Wayne Wonder), Shaggy revisits that vintage vibe, the essence of the so-called “Reggae Revival”. What is that essence? Strong story-telling in the songwriting, gaining input from so many different artists and producers, the originality of the one-drop, the accent of the guitar, horns, bubbling organ, live drums, deep bass all setting a perfect table for the singer, and in this case more than one singer to provide delectable soul food - comfortably over the riddim. This is a key aspect of the reggae revival, in a climate so desperate for unity, for teamwork amongst varied producers, incorporating varied styles, just like they had when the original art form was created 50 odd years ago and how it thrived to become what it is today on a global scale. This is Shaggy’s loveletter to reggae and to Jamaica, even the title indicates it, a nod to the national motto of Jamdown, “Out of Many One People”. It’s also an attempt to reconnect to the roots as he explains, "I've been criticized for years for not being authentic because of my pop success...People say I'm not this...I'm not that...Now I'm doing a Reggae album with the masters and people are saying its a game changer.”. Released on his own Ranch Entertainment imprint, you can tell that people spent real time together, writing and vibing to get this sound to the level that it is, there is so much love here. Trademark Sly & Robbie sound effects, delay, the starkness, the simplicity, the space between the notes, it’s all there. Some of the guest artists, Cocoa Tea and Beres Hammond for example, should be up next for such a record, one produced with the highest standards of production that reggae music has as its foundation, at its roots, its raison d'être, the purpose that it serves as an art form. The lead track - If You Slip You Slide (You Could Be Mine) shares the “Oh Carolina” type of riddim structure and likely will share its destiny for greatness. Sung as are all the tunes in combination, with Melissa Musique who shines with her vocal acrobatics and graceful tone. Shaggy uses the intros on many of the tunes to mention the artist’s names and set the stage for their entrance. For Till I Kiss Ya female vocalist Samira starts the song over a deliciously slow one-drop. Shaggy makes the pledge that this love will last forever chanting, “Even though your far away your never outta range". If this one doesn’t make the dancefloor couple up, I don’t know what will. Like Never Before showcases the best of rub-a-dub with Cocoa Tea moving through the first verse with the freshness of an ocean breeze, and Joe carrying the sweetness to another level. There are some recognizable, remade riddims, like the original Sitting and Watching- Dennis Brown riddim on the magnficent Beres Hammond tune, Fight This Feeling, but it is mostly constructed out of original riddims, unearthed from the goldmine for Shaggy and Friend’s use. For All We Need Is Love, he enlists, Jimmy Cozier and Konshens to explore break up to make up type of relationships. This one has a haunting riddim, one that will engage the massive, and a power trio of vocalists, it has the makings of a big tune. “If me haffi ask for mi money again, me and you can’t stay friends…cause right here so your credit did end” is the intro to Money & Friends, as Shaggy gets right to the point going it alone on this track, as someone who is rated as the one of the most wealthy reggae artists with Diamond sales status (10 million albums and above). He has likely experienced some fair weather friendships in his day. For You Girl, he teams up with R&B megawatt star Ne-Yo who seems to have a wonderful time flowing on the reggae groove. The female support vocalists are lovely here as well. This is a lover’s rock song, straight, a fun ride and sure to be a banger in the soundsystem arena and beyond. Peetah Morgan and Tessane Chin make the case with Shaggy for treachery in relationships on Deadly Love. The harmonies are nice here with the group, working through the issues of trust and lust. On My Duty Tarrus Riley & Shaggy go over the anatomy of a certain female in a sensuous slow jam, dutifully pointing out that she is “one-of-a-kind”. This tune has some of reggae’s most powerful voices who are able to shine brightly in their own particular styles, Tarrus with his own unique melodic structure, Shaggy with his staccato tempo and punchline in the phrasing, its hotta fiya! The groove speeds up to a mid-tempo organ and horn seasoned ska number, Crazy - a boom shot that addresses serious issues facing humanity, the tendency for people to think of only themselves, using a timeless proverb from Jamaican patois. Damian “Jr. Gong/Gongzilla” Marley and Shaggy trade the same chorus, sung in a Jazz-influenced cadence, “It’s crazy, how they’d rather see the whole pudding spoil than to share a slice with one hungry child, mankind so unkind.”. Stating “it’s crazy”, and the patois retort, “don’t?” as in, “isn’t it?” to emphasize the selfish ways of some at the expense of the whole. For Bridges, Chronixx, the mighty next generation falsetto singer, representing the reggae revival, rises to the occasion, singing “I bet you never wish you would have burned that bridge ‘cause now you would like to cross it.”. Shaggy sings the lead verse in a call and response as the artists remind us that we should try to be respectful of others as we rise to the top, addressing the unfortunate arrogance so prevalent in the industry. This is a beautifully constructed groove, the right mix of modern and classic, with the message in the music. Super trombone blasts, rocksteady type riddim guitar and bubbling keys put Shaggy in his comfort zone, discussing Trouble Under Your Roof which addresses problems in a relationship. To end the release, Shaggy sings Scheming as a light hearted riddim sets the pace for the singer to accuse his lover of cheating. The only concern here is that so much of the drama of relationships is emphasized on the album, what about the good times? Overall, Shaggy and Friends, you ‘gwan great, keep up the vibes, the revival is in session, and the listeners are in for a soul-quenching surprise.